Online review and approval has changed the game for creative production. 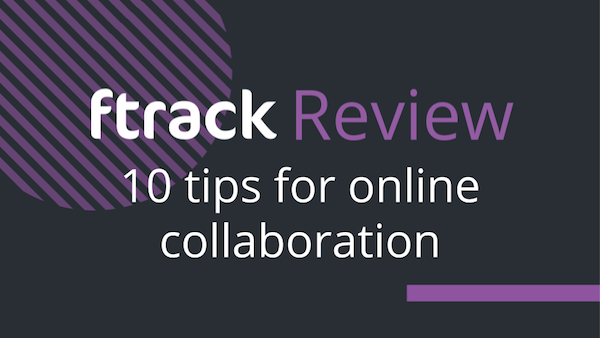 Thanks to feedback tools like ftrack Review, creatives are no longer confined by email chains, but can break out into visual, browser-based collaborative interfaces. A single annotated arrow on a piece of media can massively clarify meaning, sometimes replacing four or five email back and forths – which are simply a waste of time, especially on projects with demanding deadlines. 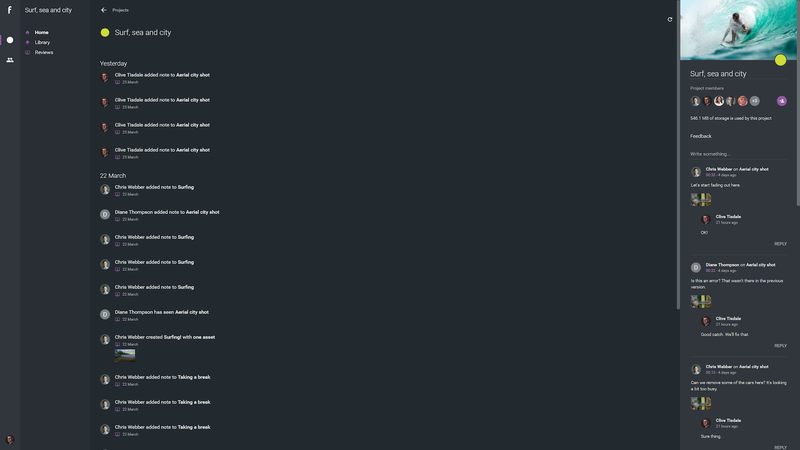 Yet for all the positives, these tools still need to be used in the right way if users are to reap the rewards of saved time, less iterations and a better final product. Here are 10 ways to ensure that your remote creative collaboration workflows can go off without a hitch. DYK: ftrack Review is designed to enable clear, precise, unambiguous visual feedback on creative projects. 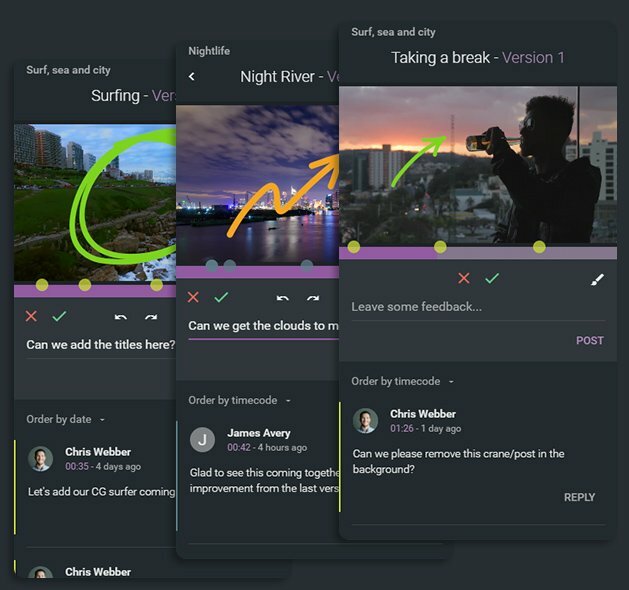 Users can collaborate on video, photoshop documents, PDFs and many other media types, showing their collaborators what they mean rather than simply describing it. What do you want to achieve with your review session? What are you seeking from all involved? Have a clear agenda and an expected outcome before you start. Make sure that your collaborators understand the aims of the project too – this will help to fine-tune and focus the feedback they provide during a session. Context is everything. Your team should know who the clients are and what each expects from a project – this will refine and clarify the feedback each of those clients leave. Conversely, your clients should know who is responding to them on team. If they know it is someone from the texturing department or an graphic designer, for example, they will have a better sense of what that person can do in response to their requests. DYK: It’s easy to manage the users of an ftrack Review account and correctly label all those who use it. Inviting external collaborators or clients to a review is as simple as sending them a link. They’ll choose a designation when they follow the link and appear in the session with that name, so everyone knows who’s who. You need to know exactly what needs feedback, where that media is and how to easily access it. You don’t want to end up an a situation where older iterations of a project that have already had feedback actioned are commented upon by accident. Make sure that you’re definitely working with the most recent version of a project before kicking off a session. DYK – ftrack Review’s Media Librarykeeps users organised. You can stack versions of a project on top of a previous asset, or upload media with the same file name, and it will automatically version up. It massively helps to reduce clutter and minimise mistakes. Every user gets 20GB of storage too, so there’s plenty of space to play with. External collaborators can sometimes be hesitant to make the first comment – start by showing the way. This not only makes clients or remote team members feel more confident with diving in but can also help to establish what needs to be reviewed. Asking questions on specific frames can stop collaborators from getting distracted by items not yet ready for review, and laser focus in on what’s on the agenda for that session. Leaving text feedback on a video without defining what specific frame or pixel of the video you’re referring to is only slightly more useful than sending an email. 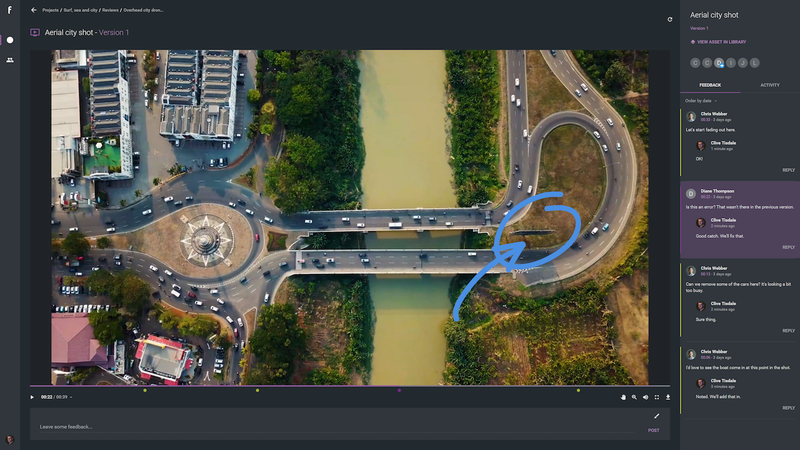 With annotations, you can circle, point to or highlight with pixel-perfect precision the element that’s in need of alteration. If you’re making a comment only, make sure it’s tagged to the frame in question or contains the media timecode. DYK: ftrack Review offers annotation tools with a varied colour palette to choose from for clear annotated feedback, and any annotations on a frame will be automatically attached as a file to a comment upon submission. Comments are also tagged to the specific frame on which they are made, ensuring all feedback is in context and leaving no room for confusion. If you’re on a call while you’re collaborating on media, make sure you’re picking up any comments that clients are making but not annotating or submitting themselves. You don’t want to miss out on something because it was only verbally communicated and no record was made of the thought – even if it was just in passing. DYK: ftrack Review has a variety of keyboard shortcuts designed to speed up navigation, selection of tools, zooming and panning. People think fast, so the quicker you can navigate on media the better! Leaving things open ended often means running over deadline. Make sure to give a clear deadline for the actioning of feedback, while being considerate of busy schedules and tasks that can pop up during the week. Once a review and feedback session is over, you should ensure that what was discussed won’t be forgotten the minute everyone gets back to their daily tasks. Create a to-do list based on feedback received in the session and set actionable goals for all involved. Share with everyone on the session so your internal team knows what they need to do and the client knows what they can expect. DYK: ftrack Review automatically generates a PDF of all comments and annotations made on media during a session. This keeps every neatly in context. Share it with your team to keep everyone completely in sync. 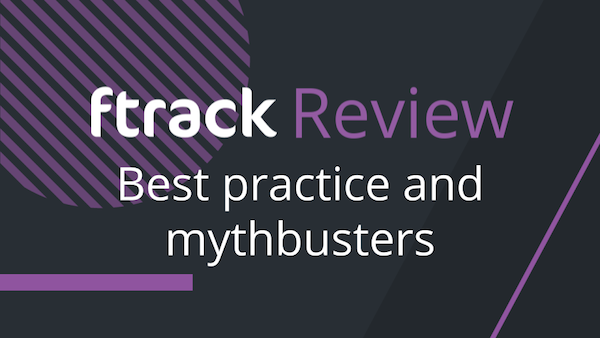 Want to try ftrack Review and see how it can boost your creative feedback cycles? If you choose to buy ftrack Review, pricing starts at $15 a month per user with 250 GB of storage per workspace. 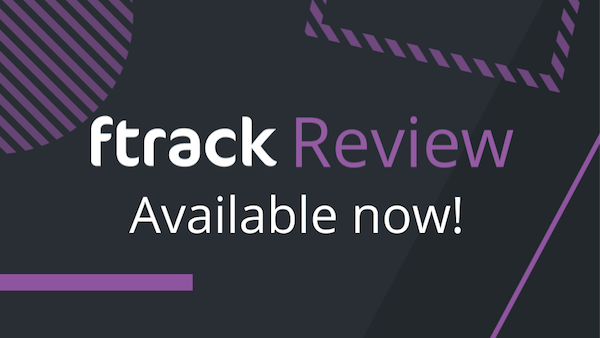 However, from now until 31st May 2019, you’re able to purchase ftrack Review at 50% off with an annual subscription. 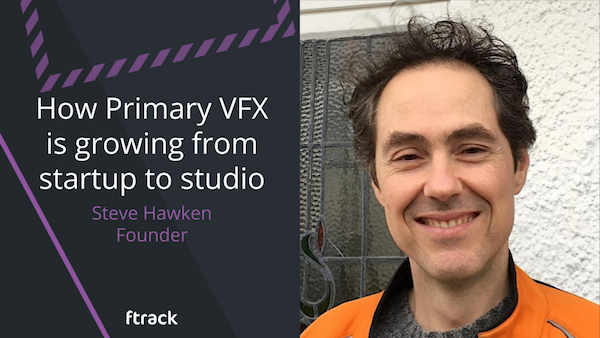 Steve Hawken, Primary VFX founder, discusses how ftrack Review has helped his studio grow from the ground up. Here’s 10 handy tips to help your online review sessions go off without a hitch. 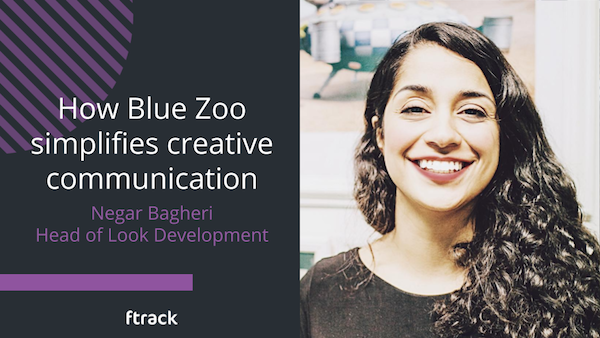 Blue Zoo’s Head of Look Development, Negar Bagheri, discusses the role ftrack Review plays in her day to day. Explore tips, tricks and alternate approaches to media review that will boost your collaborative productivity. 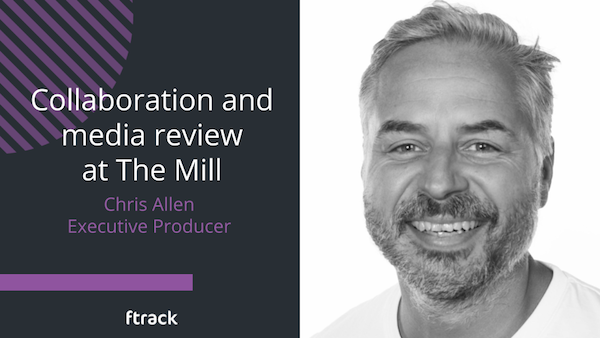 The Mill’s executive producer Chris Allen reveals how the studio has introduced ftrack Review to its existing ftrack Studio setup. Introducing the new collaborative media review platform for content creators. 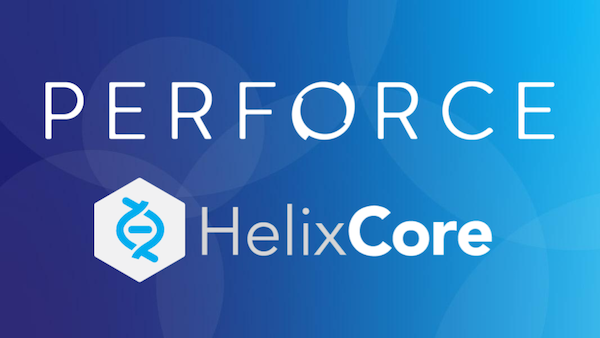 Get access to our Perforce Helix Core integration and request a meeting with the team at GDC 2019. Burndown charts can help you to quickly evaluate your studio’s performance on a project. 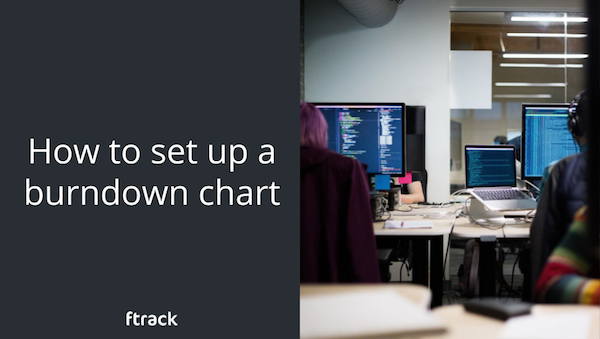 Here’s how to set one up in ftrack.